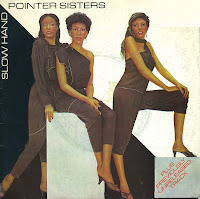 'Slow hand' is a pop ballad by the Pointer Sisters, released in the spring of 1981. It was also released on their album 'Black & White', released a few months later in 1981. The single reached number 10 in the UK singles chart - their first top 10 hit in the UK - and number 15 in the Dutch Top 40.